Jalebi, also known as zulbia, is a sweet popular in countries of South Asia, West Asia, North Africa, and East Africa. It is made by deep-frying maida flour batter in pretzel or circular shapes, which are then soaked in sugar syrup. I love Jalebi like there is no tomorrow. These beauties were quickly devoured even before I got to take more than 2. I also found that the trick to pouring the batter into the oil to fry, is not to put it into a piping bag, but rather put it into a plastic squeeze tomato/mustard bottle, this trick works like a bomb. 10ml x yellow egg food colour. 1,25ml x red food colouring. Add all the ingredients, except the food colouring to a pot and bring to the boil. Once it starts to boil, allow to carry on boiling on a medium heat, for 10 minutes. Remove from the heat, add the food colouring and mix. Allow cooling while you make the batter. In a bowl, sift the self-raising flour, tartaric acid and corn flour. Rub the ghee into the flour mixture, until it resembles breadcrumbs. In a separate bowl, whisk together the yoghurt and the water. Pour the yoghurt mixture into the flour mixture and whisk until smooth, there must be no lumps in this batter. The batter will be thick. Pour batter into your squeeze bottle and tightly secure the lid on. Once the oil is hot, squeeze circular shapes into the oil. Allow to fry on one side for about 3 – 4 minutes, flip over and repeat on the other side. Using a tong, remove the Jalebi from the oil, it will still be white in colour. Place it immediately in the syrup for about 30 seconds and then flip over and allow the other side to soak, it should now be orange in colour. Place a cooling rack on a baking tray and place the jalebi on the rack, any excess syrup will drip down into the baking tray. Repeat this process, until all the batter has been used up. 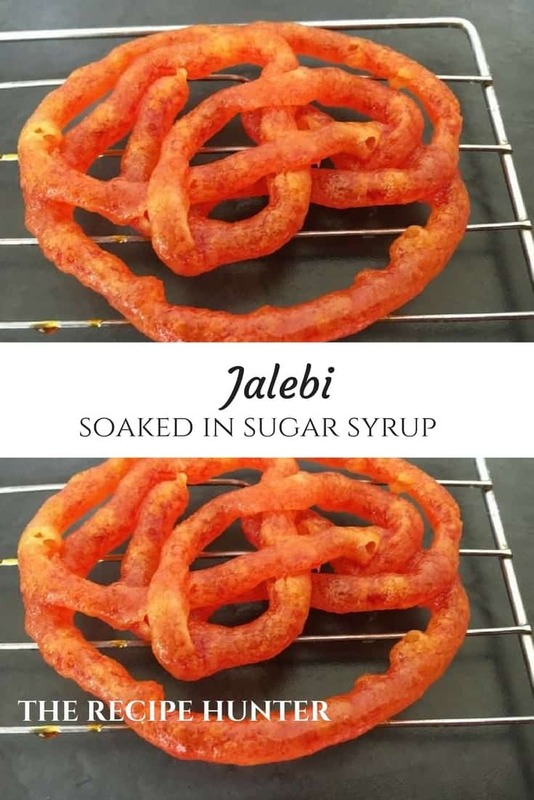 Once the Jalebi is cool, they will become crisp.